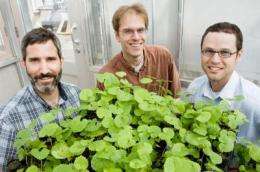 Adam Davis (left) of the US Department of Agriculture, Illinois Natural History Survey, postdoctoral researcher Richard Lankau (center) and INHS plant ecologist Greg Spyreas found that the invasive garlic mustard plant produces lower levels of a defensive toxin after about three decades in a new location. Credit: Photo by L. Brian Stauffer, U. of I. News Bureau. Like most invasive plants introduced to the U.S. from Europe and other places, garlic mustard first found it easy to dominate the natives. A new study indicates that eventually, however, its primary weapon - a fungus-killing toxin injected into the soil - becomes less potent. The study, in Proceedings of the National Academy of Sciences, is one of the first to show that evolutionary forces can alter the very attributes that give an invasive plant its advantage. In fact, the study suggests the plant's defenses are undermined by its own success. Garlic mustard comes from a family of smelly, sharp-tasting plants that includes cabbage, radish, horseradish and wasabi. Unlike most plants, which rely on soil fungi to supplement them with phosphorous, nitrogen and water, garlic mustard gets by without the extra help, said Richard Lankau, a postdoctoral researcher at the Illinois Natural History Survey (INHS) at the University of Illinois. Lankau led the study with INHS plant ecologist Greg Spyreas. "For whatever reason, these plants just don't hook up with the soil fungus," Lankau said. Instead, garlic mustard produces glucosinolates, pungent compounds that leach into the soil and kill off many soil fungi, especially those native to North America. This weakens the native plants. As a result, garlic mustard now grows in dense patches in many North American woodlands, its preferred habitat. Those patches are often devoid of native plants. Lankau began the new study with a seemingly obvious question: Once garlic mustard has vanquished most of its competitors, why would it invest as much in maintaining its toxic arsenal? He predicted - correctly, it turns out - that levels of glucosinolates in the plant would diminish over time. "When you're in a situation where the only thing you're competing with is other garlic mustard, it may be that making lots of this chemical is not a very good idea," he said. Thanks to a study of historic herbarium records conducted by co-author Victoria Nuzzo, of Natural Area Consultants, N.Y., the researchers had access to a 140-year record of the age of garlic mustard populations across the eastern half of the U.S. The team collected garlic mustard seeds from 44 locations, grew them in a greenhouse and tested glucosinolate levels in each. Those tests found that older populations - those that have been present in an area for more than 30 years - produced lower levels of the fungicidal compounds than those that got their start less than two decades ago, Lankau said. Genetic studies suggested that these patterns were the result of natural selection. That is, the plants that produced less of the toxin were more likely to survive and reproduce in older populations. The researchers then grew the garlic mustard in soil from native woodlands. After a time, they removed these plants and potted native trees in the same soil. The trees did best in pots that had held plants from older populations of garlic mustard, indicating, again, that the plants' toxin output had diminished over time, killing less of the fungus on which the native plants relied. Because CTAP includes data on plant abundance, including garlic mustard and native plants from across the state, the researchers were able to determine if native plants were declining or advancing in the presence of garlic mustard. Again, they found that older populations of garlic mustard - though still problematic - posed less of a threat to native plants than the newer ones did. While this study focused on only one plant, the results indicate that some invasive plants evolve in ways that may make them more manageable over time, Spyreas said. This suggests that conservation efforts might be more effective if they focus on the most recently invaded areas, which - in the case of garlic mustard, at least - is probably where the most damage occurs.